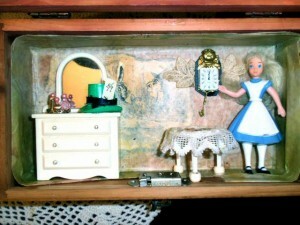 Do you remember topsy-turvy dolls? A bit like a Pushmepullyou from the story of Dr. Dolittle. Takes me back to my girlhood. 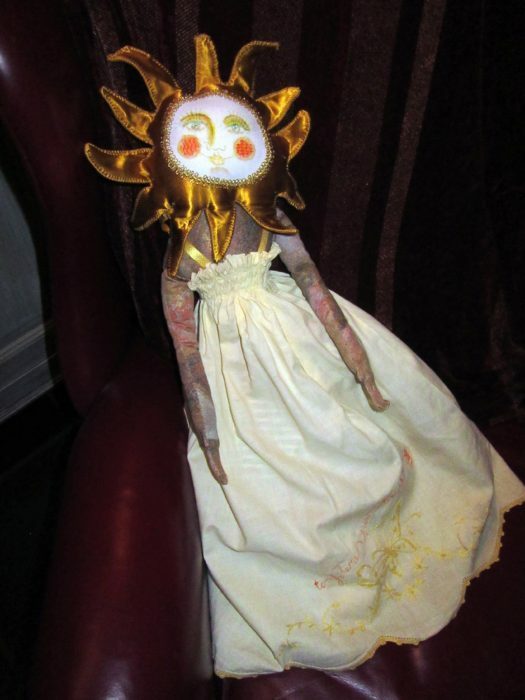 I never played with dolls, but I made dolls and made costumes for them. Always nice to have a reason to finish a project. 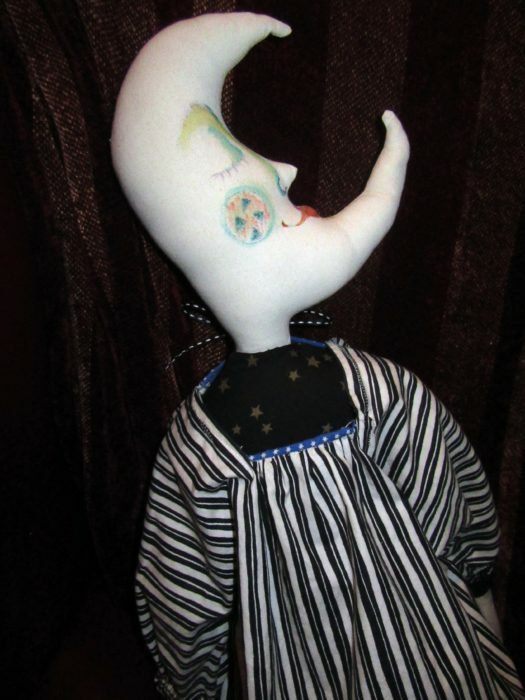 This topsy turvy doll is headed–pun intended–to a baby who is the sun, moon, and stars to her family. Only hope the dog doesn’t chew it up before she can enjoy it! I hated the result. But that doesn’t mean certain areas didn’t have potential. 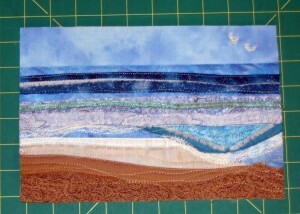 I cut up sections I liked, and fused them to Peltex–thick interfacing. The kind I had featured fusible on both sides, but I only adhered to one side, protecting my ironing surface from the other side with a Teflon pressing sheet. 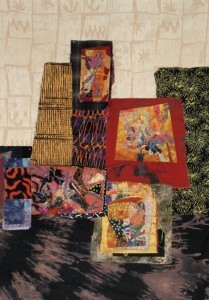 Then, I mined for gold: went through my scrap stash of mostly silks and silky fabrics for collage candidates in warm colors and light, medium, and dark accents. 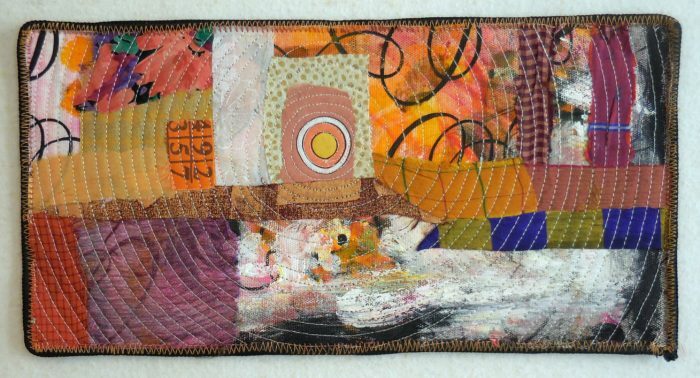 When I found a piece that played well with my painted background, I pressed fusible web to the back, and without measuring, I scissors-cut strips and rectangles. Auditioned some arrangements. Fused the scraps in place. 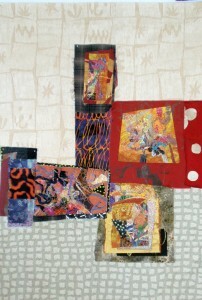 Quilted to make the compositions more cohesive. Couched cord or chenille yarn around the edges for a finish. Those painted backgrounds are pretty well covered up, I confess. 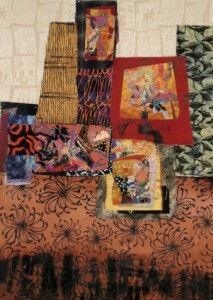 Can you find the areas of the painted fabric at the top that I used for each piece? 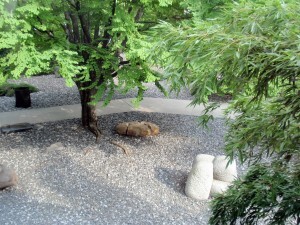 Looking for a zen-like, meditative haven? How about an intense and heady tour of some of the most riveting and revolutionary sculpture ever created? 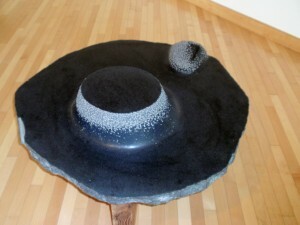 I found both experiences at the Isamu Noguchi Museum in Queens, NY. You will, too. 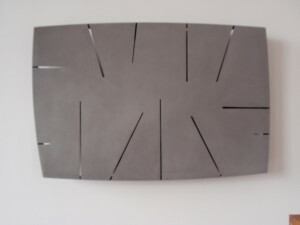 Isamu Noguchi (1904–1988) was one of the twentieth century’s most important and critically acclaimed sculptors. His mother was a Scottish-American writer; his father was a Japanese poet. 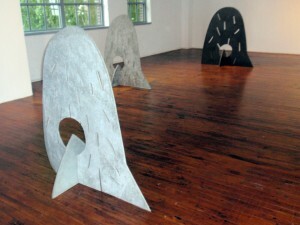 Noguchi spent most of his life and had studios in both Japan and New York. That East-West tug on his identity made him fully comfortable in neither place. He was inspired by the lyricism of nature, and the boldness of Brancusi’s reductive, powerful forms. Noguchi created huge stone monoliths and delicate paper lampshades, mass-produced furniture and fine art, public gardens and theatrical set designs. I want to produce work that is both subtle and bold. I covet simplicity but I want to convey complex ideas. I strive for the sophistication of abstraction but always seem to end up with pictures–still life, landscape, recognizable figures. 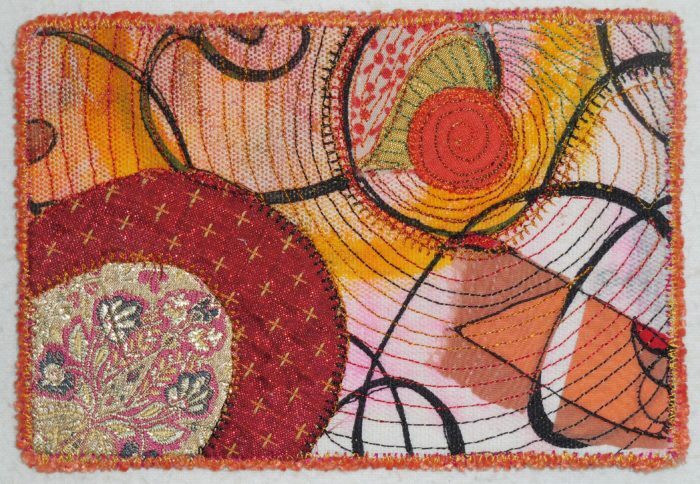 I admire the purposefulness of working in a series, yet I flit — from one sort of style, group of materials, and type of end product to another. I know I should put in the time, but I am, at heart, a quick-and-dirty worker. 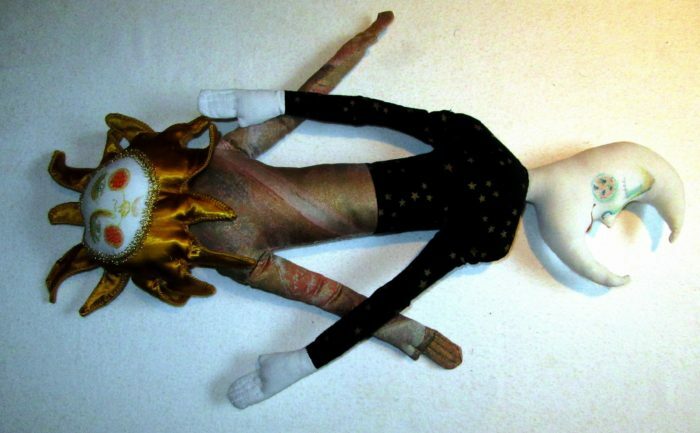 I seek popular success for my books and patterns and presentations and workshops, but I think it’d be awesome to be accepted into the lofty echelons of the serious fiber art world. Baby banners, pillows, and Skinny quilts/table runners for gifting and patterning for my recently launched EllyLdesign line on Craftsy and Etsy (another dichotomy, as I haven’t committed to just one quite yet). 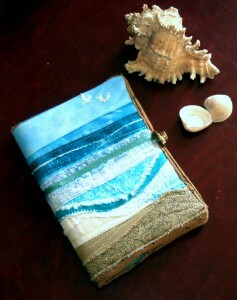 Psst–You can check out my Craftsy Shop or my Etsy Shop. I’m proud to say that the instructions are 100% reliable and user-friendly and full of how-to photos –just like my books. Let me know, in the comment box below, what you think! OK, the commercial message is over, so let me switch over to the other side of my brain. 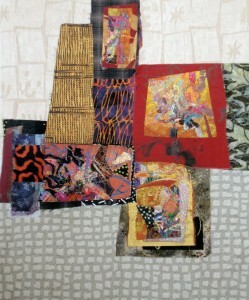 That is focused on the constantly evolving arrangements on my design wall. Here are a few of the iterations. Once again, I welcome your comments: Which one appeals most? 1, 2, 3, 4, 5, or 6? 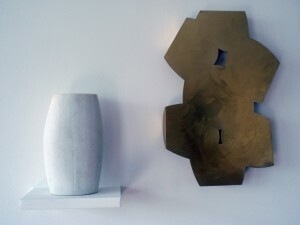 I definitely dig Noguchi’s aesthetic. He was lucky to have good critics and great supporters — he hung out with Arshile Gorky, Willem de Kooning, and a lot of other abstract expressionists. He found ways to nourish and bridge the different aspects of his identity and to address many different interests, putting the tensions of opposing forces to work in his favor. Me, I often feel like Dr. DooLittle’s pushmi-pullyu, that crazy, two-headed unicorn gazelle, trying to go in two opposing directions. Still, I’ll get there, wherever there is, somehow, sometime! Thank YOU for the criticism and the support. Heck, thanks for reading this! I have a passion for little things in life. Dollhouses, tiny dolls, miniature villages and train displays, demitasse cups, bonsai, newborn babies—who isn’t captivated by these wee charmers? Those were the words that introduced my book, Marvelous Miniatures, part of the Rodale’s Successful Quilting Library Series. And years before that my first book ever came out: Great Little Quilts: 45 Antique and Doll-size Quilts with patterns and Directions (Harry N. Abrams). 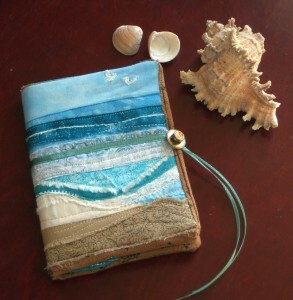 Another book I authored is Creations in Miniature: 101 Tiny Treasures to Stitch & Craft (published by Krause). See a little trend here? Yup, I love quilting and crafting miniatures…especially when they are quick. As gifts, they can be very personal. 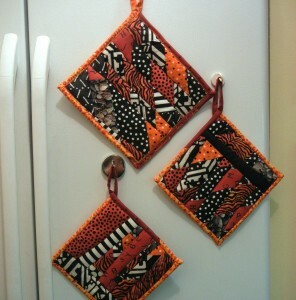 And no risk: unlike a big quilt, they can be displayed anywhere at all. This year’s Christmas gift for dear friends who travel and therefore cannot water houseplants regularly and who adore their springer spaniel. 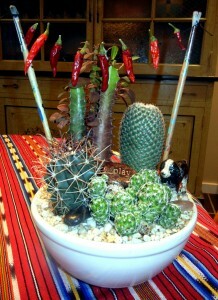 Cactus pot from my local Lowes, tiny jalapeno peppers, black heavyweight thread, two old paintbrushes, iron vintage look dog figurine, engraved and plain polished stones. 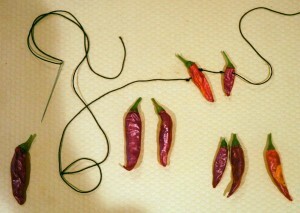 Thread peppers onto black thread, making knots to keep them separated. Tie ends onto paintbrushes and insert into pot. Set figurine and stones in pot. For a wonderful, witty, and fabulous BFF, a Lewis Carroll fanatic and a high-powered NGO advocacy leader in Washington DC, who lives an adventure filled with comic characters, changing scenes, and strategic challenges. 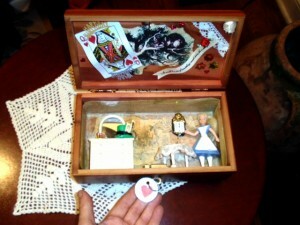 Small wood chest/jewelry box, photocopies of illustrations from Alice Through the Looking Glass, vintage-look tissue paper, decoupage medium, mini, 3-legged “table” to keep a box lid off a pizza, green leprechaun’s hat from a St. Patrick’s Day cupcake, a playing card, plastic miniatures–dresser with mirror, perfume bottles, Alice doll, playing card, Happy Birthday confetti, bits of lace, ribbons, ribbon rose, watch works, stickers, glue dots and hot glue. 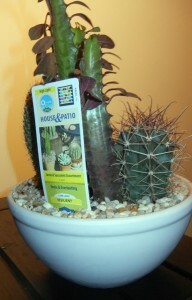 Different adhesives performed different jobs in this assemblage. 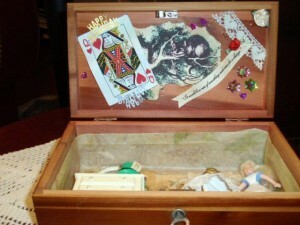 Brushing decoupage medium under and over photocopied illustrations–torn or cut–and tissue paper, I decorated the insides of the lid and box. Using tweezers to keep fingers from getting burned, I hot-glued the heavier playing card, plastic figurine and other assorted items in place. Glue dots came in handy for the tiniest items, and stickers stuck as expected. 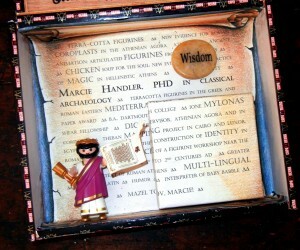 This gift was inspired by a niece who’d just received her PhD in archaeology. After wrapping a piece of jewelry by a local artist in a small box, I incorporated the gift box into a larger, personalized scene. 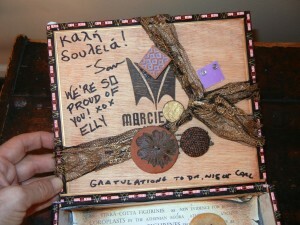 Invited the hubby and son to add their congrats, then packed it off, well-padded, in a slightly larger box. 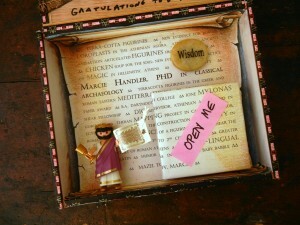 A cigar box (chosen as my niece’s name is part of the brand name), text pertinent to Marcie’s dissertation, which concerned pottery in ancient Greece, typed and printed out on old, scroll-look paper, hand-made ceramic buttons, ribbons and twine, currency, an engraved stone, and a Playmobil figure with relevant accessories. As described above with number 2, various adhesives did the necessary securing of objects. The little gift box, wrapped in the same text document as the background, was too camouflaged to be seen. That’s why I had to direct attention to it, with a little OPEN ME post-it. Last-Minute Friendly? Not so much! Stay on the lookout all year long for inexpensive little items that speak to a loved one’s interests. Neighborhood tag sales and garage sales nearly always include minis, from Happy Meals to games with only some of the playing pieces. 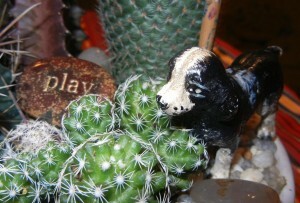 Buy polished rocks with a little saying at museum shops and gift stores. Whether you send handmade gifts,–whether it’s quilty or crafty, or just participate in the packaging and wrapping of gifts…it’s an impressive show of love. Keep it fast and fun. And make it personal. Such touches make these gifts that will be kept and cherished! Please leave a comment before the year ends, telling me what you pursue in the miniature creative realm. 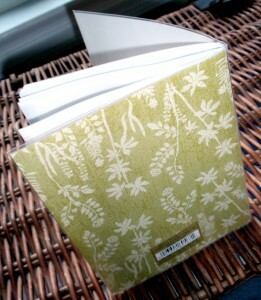 I’ll award a copy of my book, Creations in Miniature, to each of three lucky mini-lovers! Be sure to subscribe, and you’ll get wind of new postings—approximately two per month. Hope your holidays are hugely enjoyable, and may all your problems be miniature ones! “Today I am a man.” This is the proclamation given by a 13-year old Jewish boy as he becomes a bar mitzvah–son of the commandment. At one time, the ripe old age of 13 –12 1/2 for a girl–meant eligibility for marriage. While that’s no longer the case, and while no one throws such a child the car keys or lifts the weekend curfews at this stage, the occasion does herald an elevated status and increased responsibilities. For example, a 13-year-old boy counts towards the minimum number of people required for opening up the sacred book of the Torah. He can be asked to be a pallbearer. He is expected to fast at Yom Kippur, the day of Atonement. In progressive Jewish communities, these are all true for a girl, or bat mitzvah, as well. My cousin–twice removed, as we count the generations between us–reached this milestone earlier this summer. 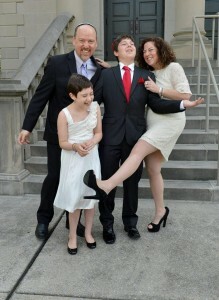 At which time his mother released the most wonderful, exuberant family picture. 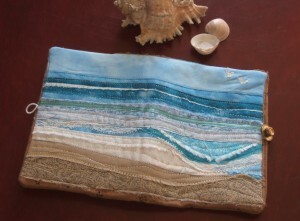 Which I photo-transferred to fabric, framed with fabric, and made into a bag. Such a patchwork treatment is tote-ally appropriate for a man bag… NOT. And I hardly expect my cuz to carry it as he goes about with his pals. Still, his “Today-I-am-a-man-bag” was a good place for me to tuck in a check, and I would hope that it can maybe hang in his room, holding some photos, albums, cards, and other souvenirs of the big day. 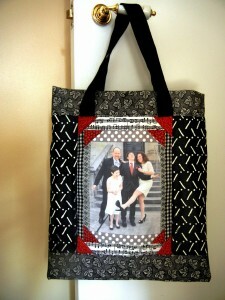 I’d love to get your comments sharing how you personalize gifts of money, or tote bags. And to see a ton of quick, easy-to-make, and wonderful bags by celebrity quilters, do check out my book, Unforgettable TOTE BAGS. It’s a free giveaway for every single attendee if I’m giving a trunk show or other presentation to your guild in the next year…or while supplies last. Otherwise, it’s almost a giveaway on my website. 1–It’s just a tote bag, not an heirloom. 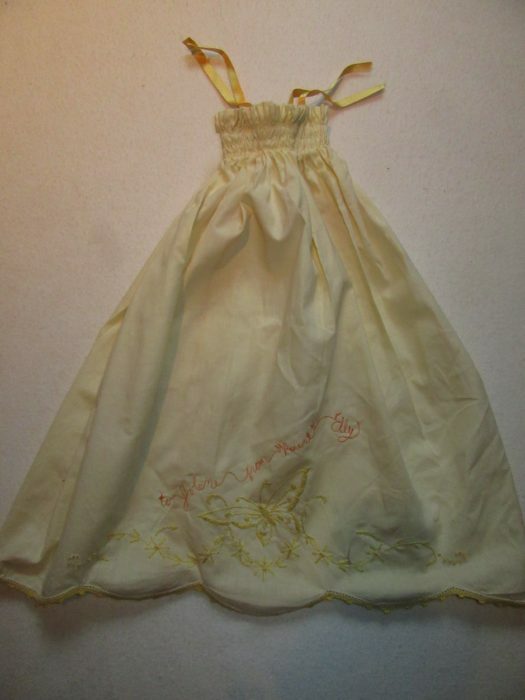 So yes, you’re supposed to soak fabric in Bubble Jet Set or other product before doing the photo-transferring, in order to prevent the image from fading over time. But again, it’s just a tote bag. You might want to forget about all that prep work. 2–Use a ready-made tote bag as a lining–you know you’ve got a bunch of canvas totes with irrelevant logos splashed on them. Let the dimensions dictate the bag you make. Use a permanent-ink marker on the logo-less back to write a message to the recipient on the bag. Alakazam: combination gift, gift bag, and card! 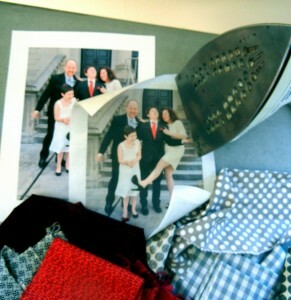 3–Iron the fabric to paper-backed fusible web. 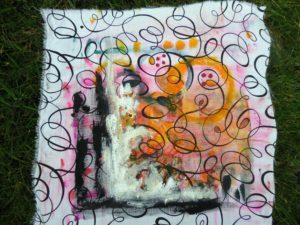 This is usually done with freezer paper, but either way, the paper backing stabilizes the fabric so that after you trim it to 8 1/2″ x 11″ it can pass through your printer. Now, it’s a piece of cake to pull off the release paper and fuse the photo-transfer to the center of a rectangle of fabric that’s just 1/2″ larger all around than the tote bag. This background fabric will be used as a foundation; you won’t see it, so it doesn’t matter what it looks like, as long as it doesn’t have a dark graphic that might show through the photo. 4–Pin coordinating fabric strips to one side of the photo, with right sides together and raw edge of the strip overlapping the edge of the image by 1/2″. 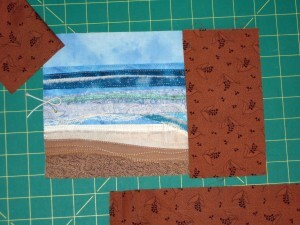 Stitch, 1/4″ from the raw edge, then press the strip to the right side. Repeat on the opposite side of the photo, and then on the two remaining sides. This makes a frame, like Log Cabin Courthouse Steps variation. 5–For a Pineapple Log Cabin with the look of photo corners, lay short strips of contrast fabric (here, red) across the corners, with right sides together. 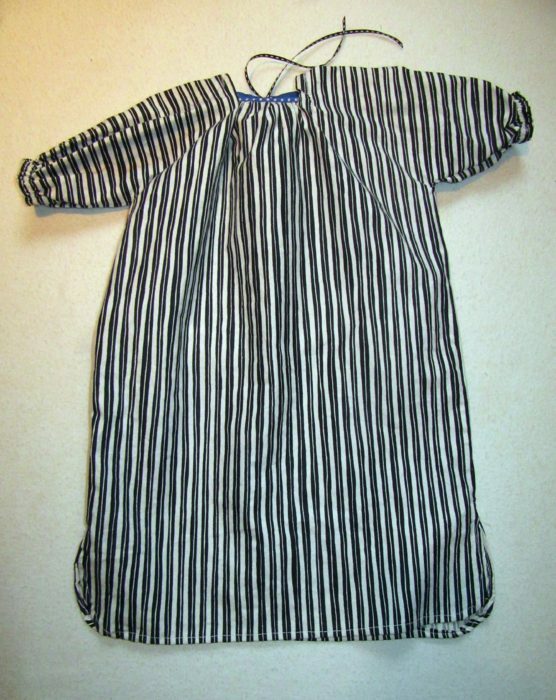 Stitch, turn outward, and press. 6–Repeat steps 3 and 4. 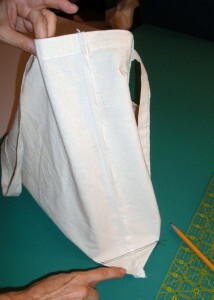 Add framing strips until the bag is 1″ wider than the tote you’ll use as the lining, plus an additional 3″ at the top. 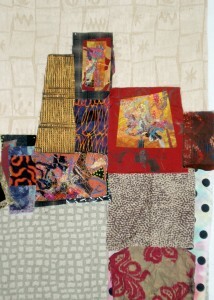 7–If you want, place the bag front on batting, and quilt as desired. I didn’t. 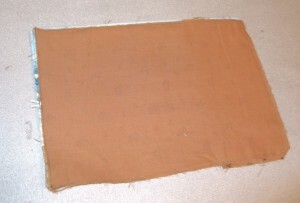 8–Cut a same-size rectangle for the bag back. 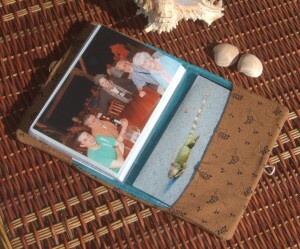 Place the back and front together with right sides facing, and stitch along the sides and bottom, 1/2″ from the edges. Turn the top edge 1/2″ to the wrong side, and press. 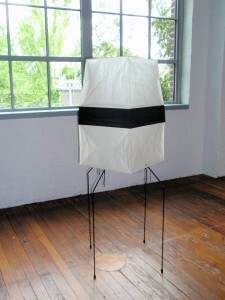 9–Make a boxed bottom: If the tote bag has a bottom, measure how deep it is. 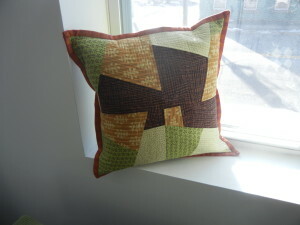 With the patchwork exterior still wrong side out, align the bottom and side seams to create a triangle. Stitch the base of the triangle, so that the height of the triangle is equal to the depth of the tote bag bottom–or the depth of the bag you want to create. 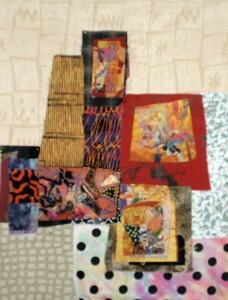 10–Turn the patchwork bag right side out. Cut off the handles of the commercial tote bag, and turn the bag wrong side out. Stuff it into the patchwork bag, aligning the side seams and bottom. Turn the 3″ excess over the rim, pin along the folded edge, and stitch. 11–If you want, stitch down into the bag as far as your machine can, to quilt or at least secure the exterior and lining of the bag. I didn’t bother. 12–Add back those handles. I actually ditched the ones that came with the commercial tote and used two 20″ lengths of black webbing. 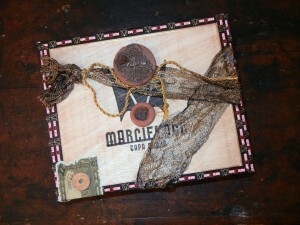 13–Stick a check or gift certificate into the bag and mail it to the lucky recipient! Mazel tov!